Someone, in a long proud parade of projects time parent volunteers, knew she would be doing temperature experiments with her small group, and arrived carrying these perfectly designed mitts. The mitts are made of plastic baggies, filled with puffy stuff for insulation. 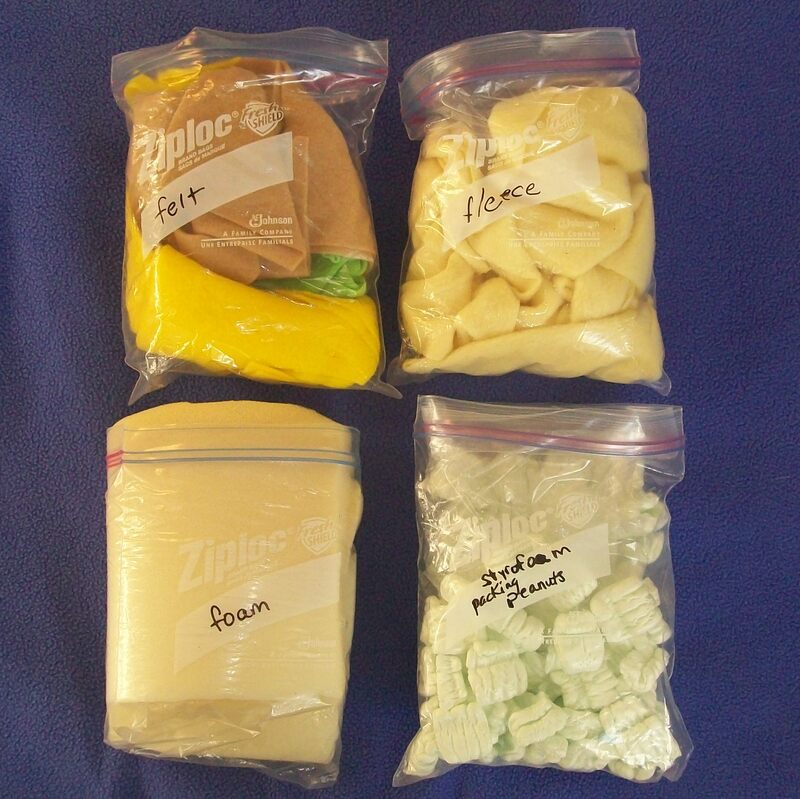 For the plastic peanuts and the fleece, there are two bags, one inside another, flipped edge to edge so they could zip together and contain, between them, a consistent depth of insulation. Into the baggies, kids inserted a Vernier temperature probe, a specially designed thermometer with a line to attach it to a computer interface. Measuring the temperatures of small buckets of ice or heated water, they examined the data on real-time graphs, which were created by Vernier software on the computer. Students could see the curve as the temperature rose or fell. The mitts let them compare the effectiveness of various kinds of insulation. 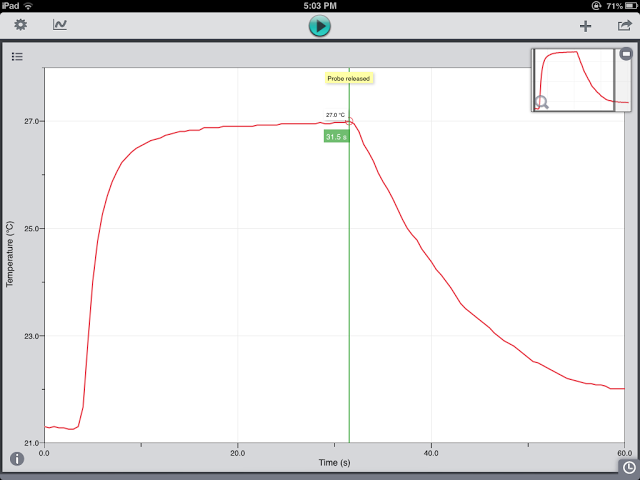 Here’s a graph of a very simple trial, in which a student held the temperature probe directly in her hand. The graph rises gradually to a peak, then falls off quickly—but not instantly—when the person’s hand is removed. Sometimes we compared: which hand was warmer, right or left? Did that correlate with the person’s handedness in any way? Could we be sure of the correlation, or were there too many other variables, not controlled? We did experiments of this sort before we had computer probes, of course, just using regular thermometers. In the very earliest years of using The Voyage of the Mimi, thinking about whales and the insulating effect of blubber, we found ways to test the effectiveness of insulation, and these mitts would have been perfect. 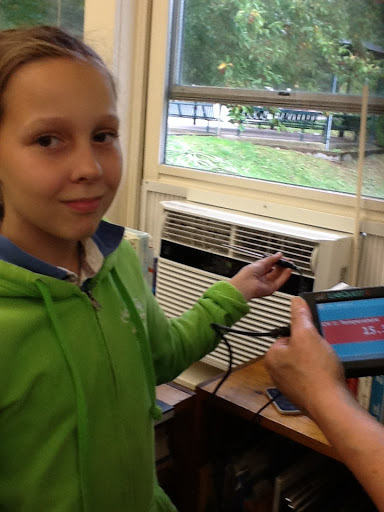 More recently, working with the occasional use of a small classroom set of iPads, we used a Vernier temperature probe along with a interface called a LabQuest2, to let us gather and graph temperatures outside, streaming the graphs, as they were drawn, on multiple iPads. Here’s a group who’ve come inside to debrief. (You can see the temperature probe in Abi’s hand.) They were playing a game called Microclimate Tic-tac-toe, and looking at the tic-tac-toe grid on the small whiteboard in Patty’s hand, to review what they’d found. For now, it’s enough to say that they were searching for microclimates: localized, specialized conditions of temperature, light, and moisture. This group has found very hot temperatures on a large black tire on the playground. They can feel the high temps even with their fingers. Another student uses a second iPad to watch the graph as it’s drawn from the probe data. Meanwhile, there’s a much cooler place nearby, in the shadowed, moist soil next to the tire. The very compact LabQuest2 device is just visible in the lower left corner of the photo. 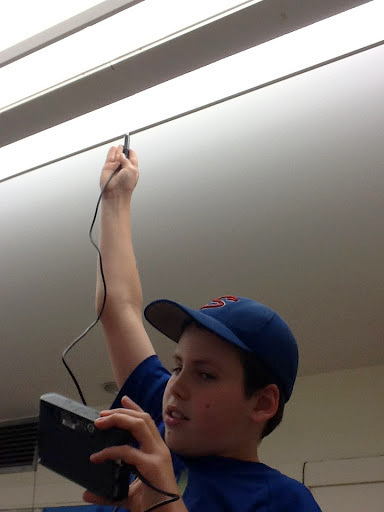 It communicates with the iPads using one of the school’s WiFi networks. Here are members of another group working inside, finding the coolest and warmest temperatures they could locate in the classroom. What did we want the kids to get from all this data collection? We wanted students to join the admirable horde of humans who’ve started out understanding the world by figuring out how to measure it. We wanted students to feel comfortable describing the world in quantitative terms, in numbers with a unit of measurement attached. 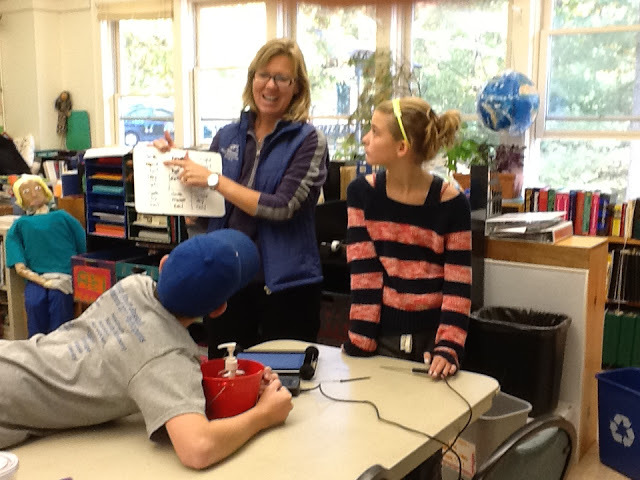 In this case, measuring temperature, we wanted students to become flexible about using either Fahrenheit or Celsius, and we wanted them to operate at an intersection between data collected with appropriate measurement tools, and the testimony of their own senses, so that the numbers acquired sensory meaning. 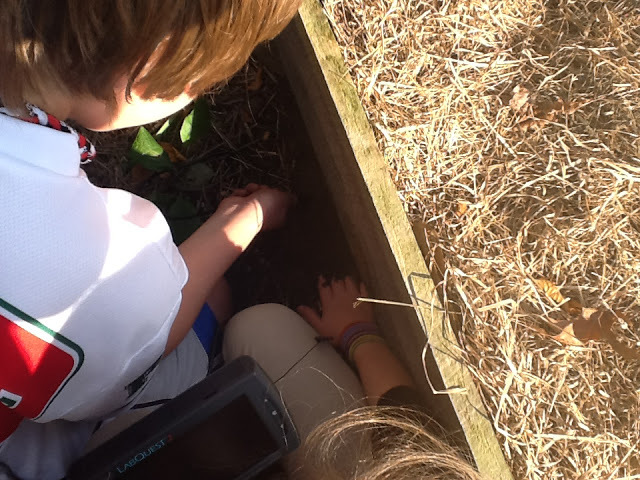 I’m working on this post on a perfect day for searching for microclimates outside: a chilly wind, bright sun. In conditions like these, kids could easily find temperatures varying by as much as 20 degrees Fahrenheit, often within a few feet of each other. And if students were hungry for something really dramatic, we’d send them off to check the hood of a black car in the parking lot. They might never look at a black car on a sunny day in quite the same way again. 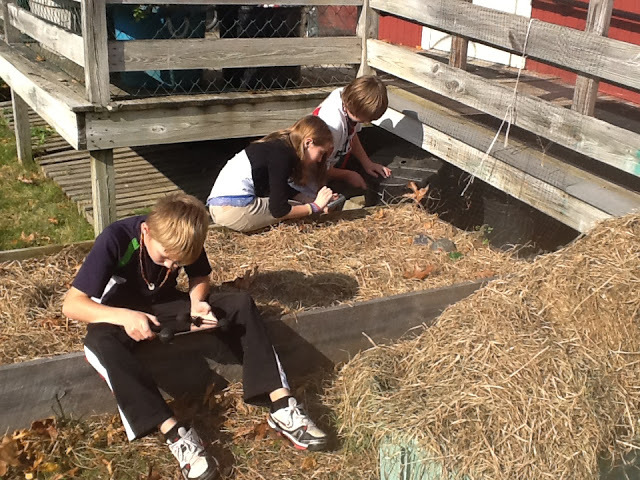 This entry was posted in Experiments, Fieldwork, Mathematics, Science, Technology and tagged hands-on learning, inquiry learning, insulation, iPads, LabQuest2, measuring temperature, projects time, scientific investigation, small group projects, temperature, Touchstone Community School, Vernier probes, Vernier software by pollybrown2013. Bookmark the permalink.